Looking for a budget-friendly snack subscription box that’s worth it? Check out Graze! With this box, you can try a variety of delicious snacks every month (or more often, if you’d like) without breaking the bank. Their snacks come in pre-portioned packs that are perfect to take on the go. They have hundreds of delicious snacks to choose from—there are options for any diet! 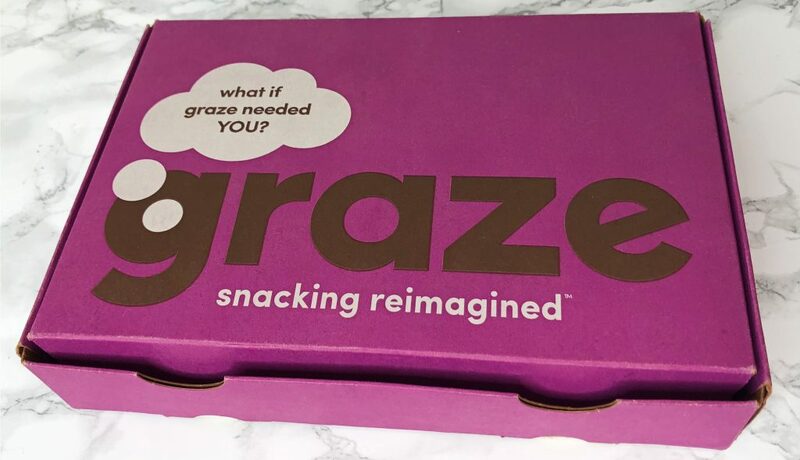 This Graze review shares my opinions of the snacks I received in this box, how you can get your first box for under $4, similar snack subscription boxes, and more. This month, my Graze box came in one of their purple boxes. My snack packs were placed neatly inside, in addition to a sheet with the nutritional information for each snack. Since I opt for only plant-based snacks, there aren’t as many options to try and I often receive duplicates. However, there is still a large variety of options compared to many other snack subscription boxes. As with all my previous boxes, I received eight delicious snacks! I’ll be sharing each below. This is my favorite snack from Graze. The “cheese” flavoring tastes so yummy! I’m glad I got two of them in this box. 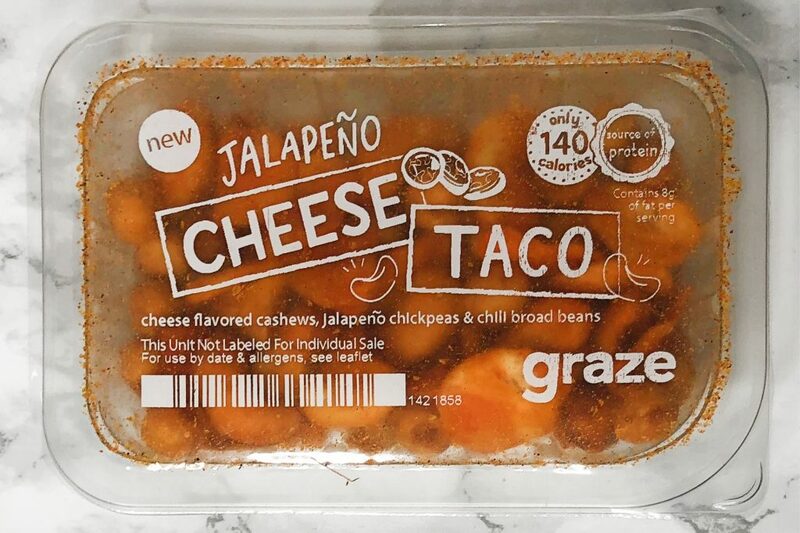 Although their other snacks are yummy, I still wish Graze made more creative vegan flavors like this. Since I’ve subscribed to Graze for a few months now, I figured I had tried all the plant-based snacks they had available. However, this new snack surprised me! It’s a fruity mixture of banana coins, dried mini strawberries, dried blueberries, and cranberries. I really enjoyed it. It’s also a pretty low-calorie snack because the pack only has 130 calories. Before I tried this snack, I thought I didn’t like edamame. Turns out, it’s much better when it’s dried rather than cooked. In addition to edamame, this snack also contains spicy chickpeas and salt and pepper seasoned cashews. It’s a delicious mixture. The entire pack contains 170 calories, 22% of your daily fiber needs, and 10g of protein! This snack consists of mini strawberries, blackcurrants, and soft apple slices. Although dried fruit isn’t my favorite, I loved this mixture! As for nutritional information, this one contains 80 calories, 19g of carbohydrates, and 2g of fiber. There’s lots of sugar as well since it’s just fruit. This snack is great! It’s made of roasted hazelnuts, redskin peanuts, jumbo raisins, and cranberries – some of my favorite nuts and berries. As you might be able to tell by the name, it’s a great source of Vitamin E and is also high in manganese (which helps protect cells from stress). The Vitamin E Defense snack contains 190 calories, 12g of sugar, 10% of daily fiber needs, and 5g of protein. 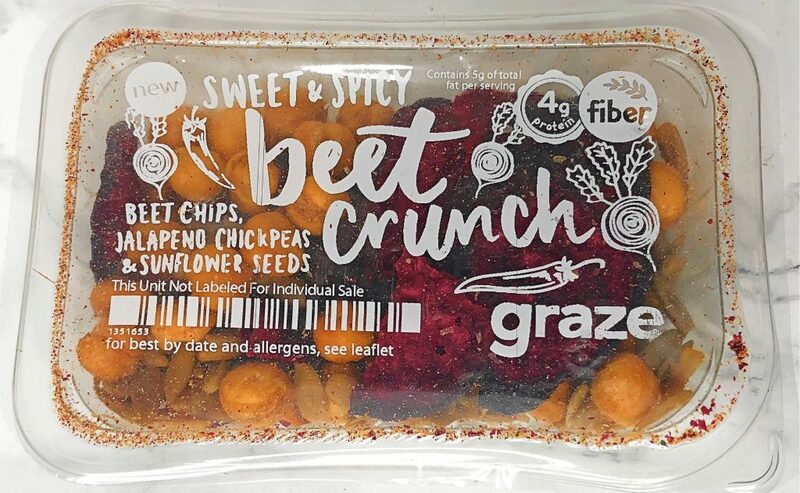 This snack is made of dried beet chips, sunflower seeds, and jalapeno chickpeas. A lot of people stated that they didn’t enjoy the texture of the beet chips, but I didn’t mind it. This was surprising because I rarely like beets! I loved the sunflower seeds and the spice added from the jalapeno flavoring. This snack is a good source of fiber and protein, and it has just 100 calories. 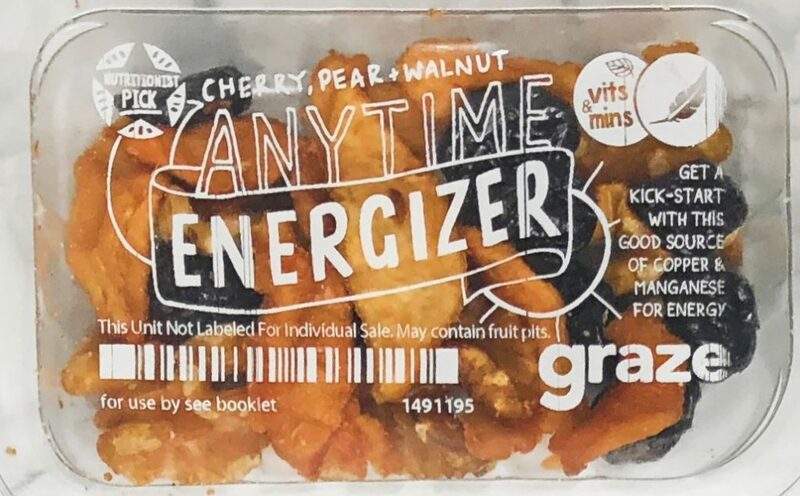 The Anytime Energizer snack is made of dried pears, dried sour cherries, and walnuts. I liked this one as well. I’ve found that it’s a delicious combination to put on salads. The chewy and crunchy mixture is perfect. Plus, it only has 150 calories (plus a few essential vitamins and minerals)! 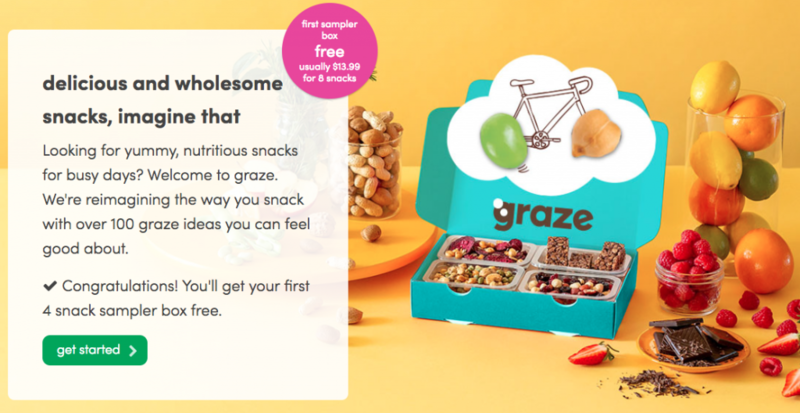 One of the things I love about Graze is that they offer great deals for new members! For one, you can get a free trial box (you just need to pay $3.99 for shipping). This comes with four snack packs rather than eight. On the other hand, you could start with the full-size subscription and get half off your first box! This comes to $6.99 for eight snack packs, which is a much better value. Plus, you’ll get to try more snacks. If you don’t like the subscription, you can cancel at any time. 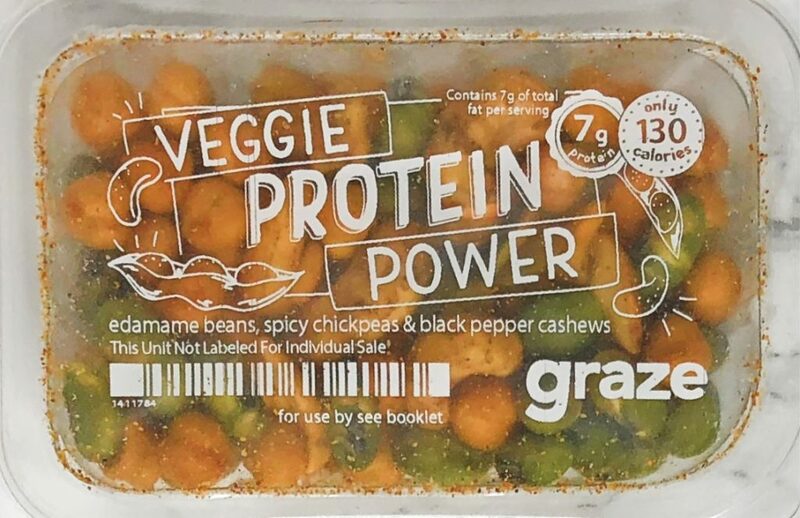 Snack subscription boxes have become pretty popular, so there are plenty of other options similar to Graze. I’ll be sharing a few comparisons here, but we also have a list of the best food subscription boxes with many more options. Naturebox, for one, is similar to Graze in many ways. They offer healthy snacks that are created by their own brand. Rather than a monthly subscription, however, they have a yearly membership. This grants you access to their exclusive member pricing and $5 snack credit each month. 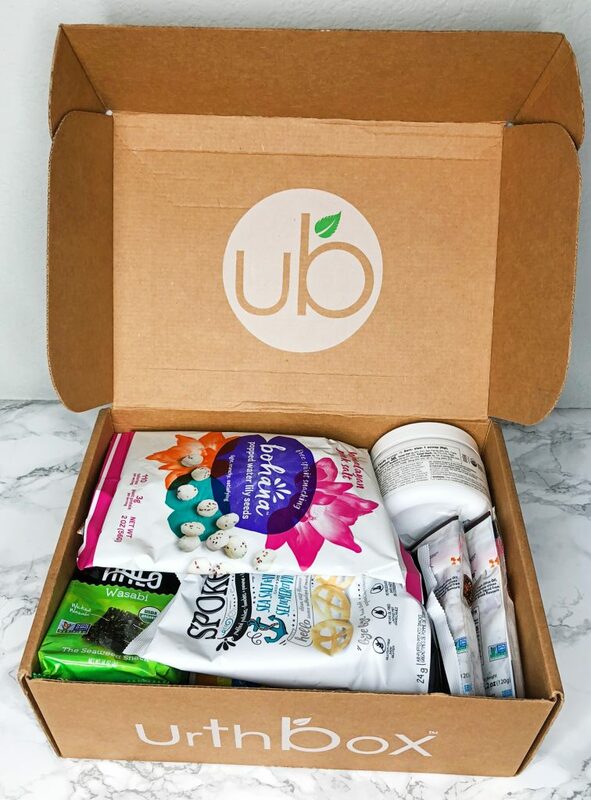 Another snack subscription box I love is Urthbox. The main difference with this subscription is that all of their snacks are from different brands. They offer monthly subscriptions ranging from $19.99 to $39.99 (they have four different box sizes). In addition, they offer vegan, gluten-free, low-calorie, or classic boxes. As usual, I was pleased with my Graze box. Their snacks are delicious and the packaging is very convenient to take on the go, which I love. Plus, the serving sizes are perfect. This subscription is fairly inexpensive and, in my opinion, is definitely worth it. This subscription would make a great gift as well—everyone loves snacks!